He paused, looking for the term to describe Whedon’s style. I like to think of as ‘popcorny’: it lacks depth but has something of the the director’s typical more-ishness. Joss Whedon: cult writer, director and soft comedy genius, has come to epitomise modern pulp movies and television with a feminist bent. His work teems with humorous melodrama and has the ability to be more sincere than any Hollywood tragedy. Sitting there in the movie, we knew that Thor: The Dark World was actually directed by Alan Taylor and written by collaborative team Christopher Markus and Steven McFeely of Captain America, and Christopher Yost of Marvel. But my friend was right, the story unfolded with such similar tones and dialogue to the ensemble productions of Whedon it wasn’t hard to agree that this style could now be Marvel policy. However, while TV and film executives may have finally recognised the marketability of Whedon’s craft, it doesn’t mean that they have figured out what makes him so popular. In Thor: The Dark World, Thor’s nemesis/brother Loki is once more locked away and new enemies have arisen to threaten Asgard and its client dimensions: a race of creatures from the sunless before-time of the universe. Their leader wishes to return all the dimensions of reality to a lightless and empty void. To enact this dark and terrible deed, the enemies, called dark elves, need a bio-ethereal organism that attaches itself to a host and enhances them in some unknown way. The exact nature, origin and agency of this organism is never quite explained – but by a conjunction of circumstances it comes to inhabit the body of Thor’s unrequited lover, Jane Foster. Thus Thor must find out how to remove the alien parasite, while at the same time foiling the nefarious plots of the dark elves. Phew! I was pretty happy with the story. The script is funny, the characters all have moments to prove themselves dorky and adorable, and their interactions with each other are fairly satisfying. My issue with Thor: The Dark World comes in with the characterisation of Jane Foster, played by Natalie Portman, as it conflicts with the quirky Whedon-esque style. In the movie, the brilliant scientist Jane exists only to be depressed by Thor’s absence, submissively possessed by an alien spirit, and becomes once again desolate as Thor inevitably returns to his kingdom in the sky. This is all happening when she could have had an amazingly cool role—especially with Portman around to do it justice. Portman plays the host of an immensely powerful primordial entity that is capable of destroying the multiverse. Jane possesses incalculable power for most of the movie, a power over which everyone is fighting for control. Yet instead of ever using that power, or even becoming somehow in-tune with it, Foster simply limps around feeling washed out for most of the movie – until it’s time for her to kiss Thor. Once she watches him finally disappear, she sits at the table eating her cereal while her wacky friends try and console her. The movie’s dialogue is snappy, and it employs the whimsical characterisations that seem native to the Whedonverse, but ultimately these gimmicks are empty imitations of Whedon’s work. The writers of Thor: The Dark World exhibit no understanding of why so many people are drawn to the director’s complex and quirky characters. His female characters are not only strong, but also individual and complex, and they can make horrible mistakes as much as save the day. There were ‘strong women’ in Thor: The Dark World, but they were backgrounded, relegated to two-dimensional support characters. I am your typical geek girl-next-door, and I love my superheroes, but during this movie I found myself increasingly frustrated at everything I have come to hate about action movies (namely pointless women and underexploited story potential) being popcorny. It was that feeling you get as a kid the first time a friend says something mean, and you don’t understand why. It was a bit of a betrayal. And perhaps it’s flawed to expect another screen team to have the same deft touch as Joss Whedon—but why make Jane the crux of the story in order to simply become another macguffin? Why affect this style of humour and whimsy if not attempting to showcase the surprising depth of your characters? than whole. Loved your review by the way! 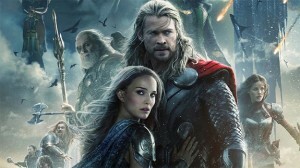 This entry was posted in Arts, Film and tagged film, joss whedon, Movies, superhero, thor. Bookmark the permalink.